UMAREX GmbH & Co. KG (UMAREX) headquartered in Germany receives the first worldwide license from the well-known Austrian weapons manufacturer, GLOCK, for the reproduction of its internationally recognized pistols. UMAREX is thus writing a new chapter in its success story as the world market leader in licensed replica handguns. 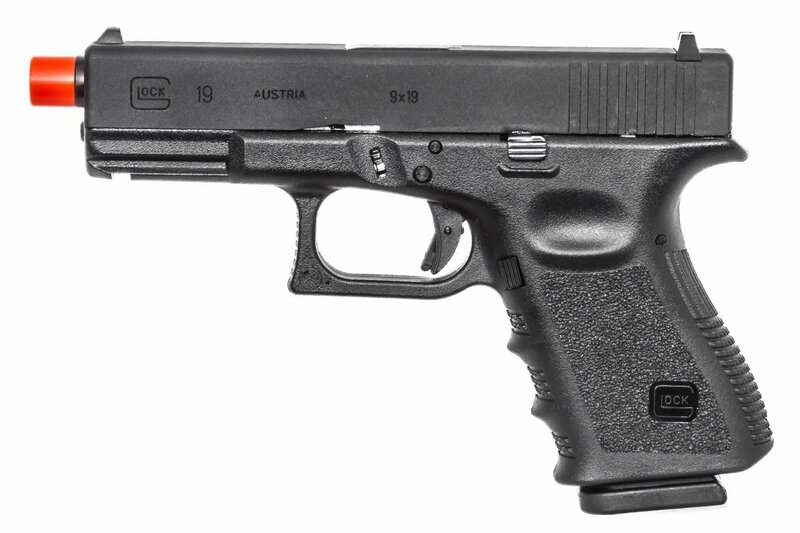 GLOCK 19 is a compact version of the standard size GLOCK 17 which fires the same round as GLOCK 17 and introduced in 1988, mainly for military and law enforcement. It comes with a smaller frame, a shorter barrel and slide, and a double-stack magazine with 15 rds capacity. 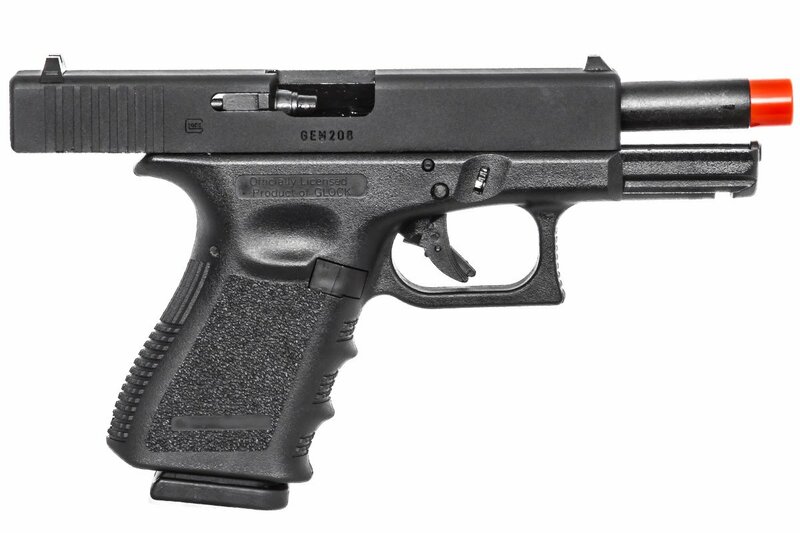 It can share the same mags that GLOCK 17 used, even the long mag for GLOCK 18C. 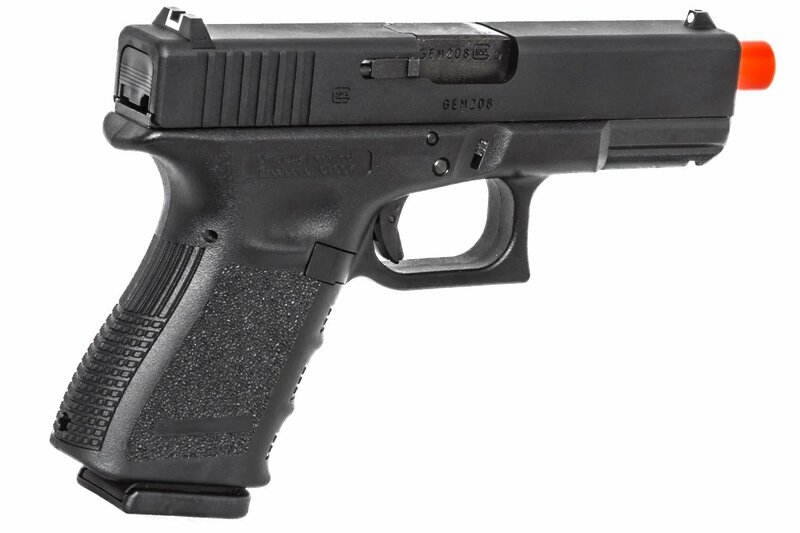 The Elite Force GLOCK 19 features a metal slide with realistic gen3 outlook, engraved marking and discrete ejector. 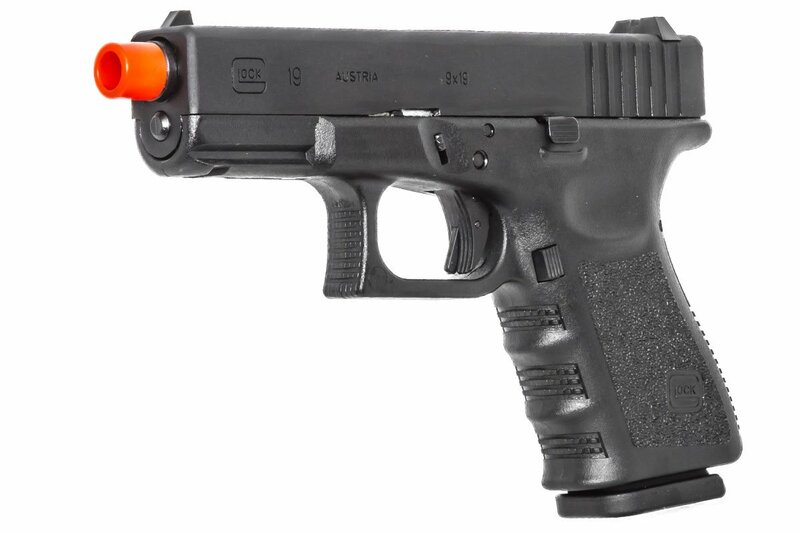 It comes with fixed front sight with white dots and standard rear sight (Real steel rear sight for Glock Pistol can be installed without modification). 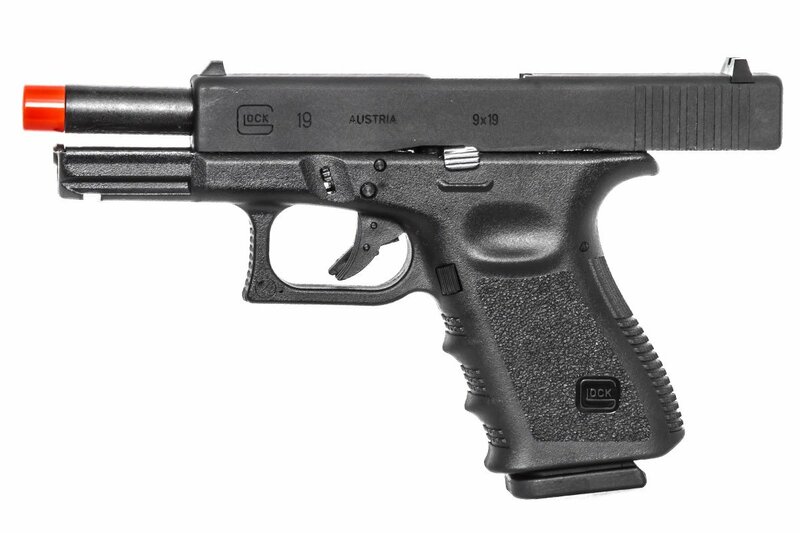 The Elite Force GLOCK 19 also comes with metal outer barrel and features the famous trigger function same as famous GLOCK real steel. I got this gun when I didnÂ’t have an account but now that I do IÂ’m excited to tel you about how nice it is! Very good airsoft version and works good.Love this guns because it fells like the real thing.These guns are great in real life and great in airsoft as well.This GBB is well worth its money. A little expensive but 100% worth it. Just received mine today and before even removing it from the box I was very disapointed with the craftmanship, especially when seeing the slide which looked like it had been badly painted with fresh flat black paint - When using the slide I even got black all over my hands - A few in and outs of my holster and the shiny metal is already showing thru on the slide - Is Glock really building this crap or is there some other place attempting to replicate a Glock 19? 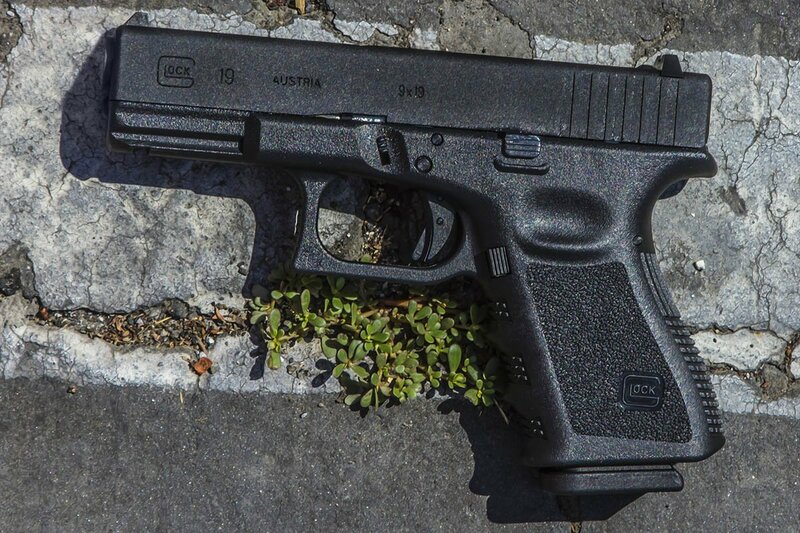 I own several Glock 19's some real deal and some Air Soft and this one is the worst quality I've seen yet - What a waste waited 6 months for crap! If you like I can post photo? Is this gun a green gas or Co2? how heavy is the glock? They are weighted similar to that of a real, unloaded glock. With the mag in they are about 3 pounds. will this fit a real Glock 19 holster? Yes, these are 1:1 ratio to the real ones. Ordered the Glock 19 last year and was told I'd have by Christmas - Well which Christmas were you talking about 2017, 2018, 2019 please what year? Mid-Late April 2018 is what Elite Force told us. When will this gun ship? 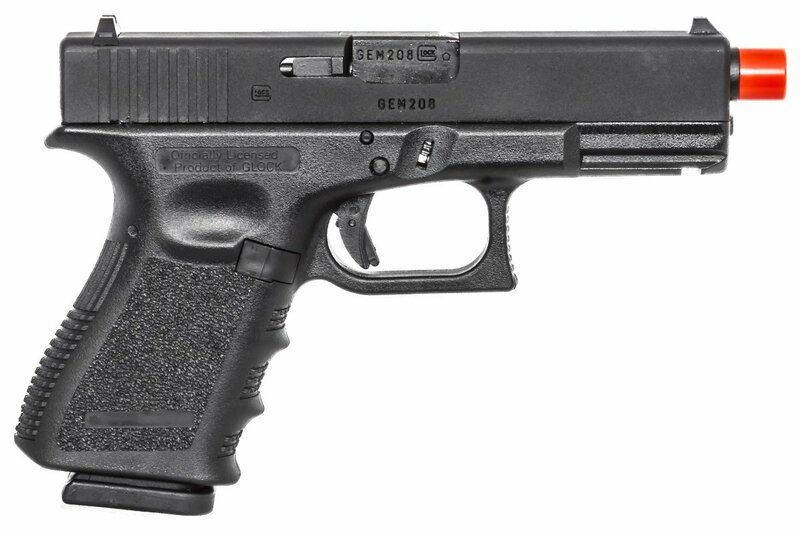 What type of bbs does the Glock 19 use? Elite Force Bio BBs should work the best. Does this gun have blowback? Will ALL glock mags be compatible to these? WE, TM, etc? Even the 50 round extendos? These are only compatible with the Elite force brand mags that will be released alongside them.